Real-time and historical audience tuning information in a convenient web interface, with more radio-specific measurements, features and filters than any other streaming service, all powered by an intelligent calculation engine with deep and comprehensive data mining capabilities. Automated report generation means no more repetitive, time-consuming tasks for busy radio station digital departments. Just set it up once, create a distribution list and move on! How has online tuning changed over the past year? And where is that growth coming from? Which apps are seeing pick-up with your audience, and which platforms? 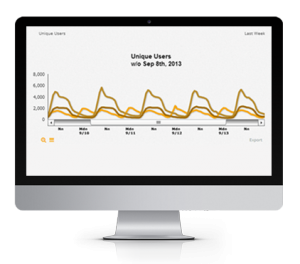 Our dashboard view provides at-a-glance insights into the kinds of trends decision-makers need to guide growth. 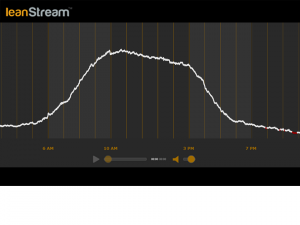 This station has two noticeable spikes in it’s tuning curve (top image). They’re both important -insofar as each represents a time of day when tuning is higher- but one of them occurs every day, and the other does not. 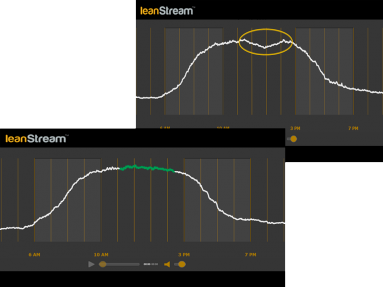 The PD Tool distinguishes between them at a glance (bottom image): the green line on the right marks a time with a statistically significant one-time spike in tuning. Can’t recall what the spike was? Just click on the graph to listen! The PD Tool compares each minute of the day to the expected historical value for that minute on that day of the week for that station. If there is a significant spike or drop in tuning the graph turns green or red at that point. We don’t even bother with a scale on the Y axis: it’s not about how many people listen – that’s the job of your ratings service – it’s about whether tuning is higher or lower than usual… and this stations ‘listen-to-win promo is definitely driving tune-in’s! This station had an under-performing noon hour show. Of course the PD didn’t need the PD Tool to know that, but she did use it to demonstrate the need for change and then, right after launch, as an early indicator of a positive result. And ultimately that outcome was reflected in the ratings. AudioMatic and AudioMax buy and supply-side platforms. custom-skinned backgrounds, because it’s about your brand. Dynamic canvas: the background image automatically adjusts to the currently live or next upcoming sport. Dynamic countdown & live mode: in countdown mode the player counts down time left until the next game, dynamically switching to live mode at game time. Upcoming games: Up to 14 upcoming games are listed, with start times displayed in the time zone of the viewer. Simultaneous streams: up to three streams can be delivered at a time. Auto-archiving: Games are posted to the player the minute a broadcast completes, and archived in HLS for fast loading and scrubbing. Scheduling: An intuitive calendar-based scheduler allows admins to add games from minutes to months in advance, or connect the calendar directly to your athletics departments RSS feed for automated scheduling. Device detection: auto-detection of the listeners device means the player renders an appropriate desktop or mobile web version. 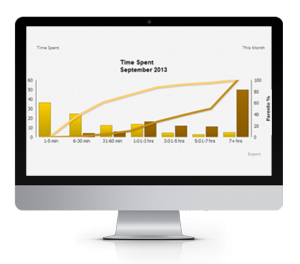 Field-level controls: mobile controls allow admins to schedule, resume and end games remotely. 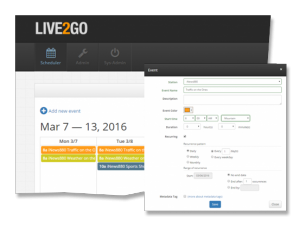 Live2Go completely automates the creation of recurring content like weather, traffic and news updates. Want to post ‘traffic on the ones’ to your player? It’s effortless with Live2Go. Intuitive Scheduler: create unlimited daily one-time or recurring events for one or multiple stations in our simple SaaS calendar. Flexible rules engine: set up hourly, daily, weekly, monthly or more complex recurrences, use time or metadata-based – or hybrid – start and end-time triggers, and mange it all directly with a click via easy-to-use dropdowns. Comprehensive user permissions: fully integrated within the leanStream SSO portal, Live2Go permissions can be set by user across any number of stations in your group. Delivery: Automated posting to your web site via RSS. leanStream is a digital audio company dedicated to serving broadcasters and advertisers around the world. 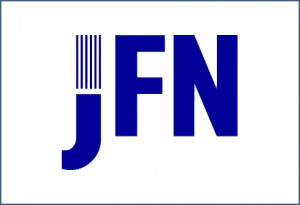 Our mission is to help our clients take full advantage of the potential of streaming audio as a source of audience engagement and a precision tool to connect audiences with advertisers. 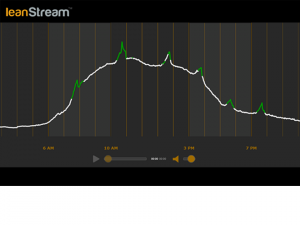 Tools that unleash streaming’s potential as a source for audience insights and revenue. Sophisticated targeting platforms to engage listeners with relevant advertising and listeners with their favourite stations. Mission-critical content delivery services you and your audience can depend on. Guaranteed. Programmatic audio advertising for brands on music streaming apps, podcasts and online radio stations. Access the largest audio ad network in the Canadian marketplace with the power of Adwave Canada publisher inventory and Deal ID’s or connect to apply for your own self-serve instance. We are integrated with all major DSP’s. Radio stations & music streaming apps generate hundreds of millions of measurable engagements with listeners each and every week! 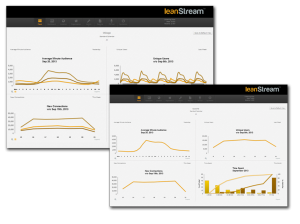 leanStream tools turn streaming sessions into audience insights. At a glance. Business leaders need audience information to build strategy, and radio stations need it to build engagement. leanStream Analytics mines the wealth of data that streaming provides, creating actionable information from massive datasets. Now more than ever, competitive advantage comes to those who can adapt, and quickly. The PD Tool offers instant feedback on your how audience behaves as programming changes. And because streaming trends reflect over-the-air trends, what you see in your stream today may well show up in the ratings next month. 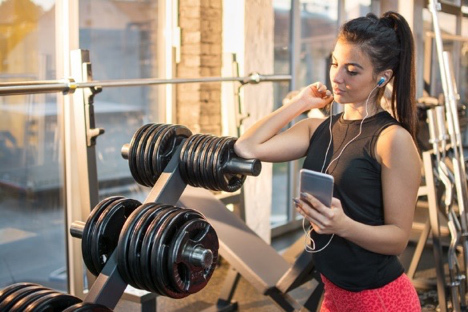 Unleash the potential of pinpoint targeting with digital audio insertion. leanstream provides Adswizz world-leading DAI solutions to all size of publishers. Medium and Small publishers: with our Adswizz-powered leanStream ad server, smaller publishers are finally able to take full advantage of the best DAI in the world. 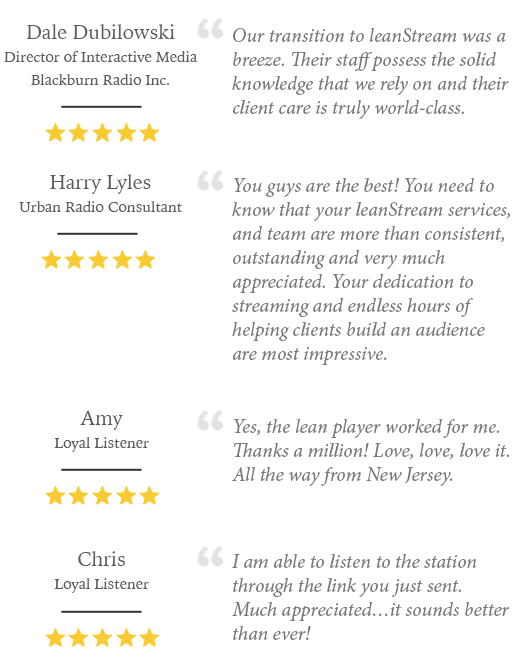 We believe listening online should be as easy as listening to the radio. Pssst: Want to use your own player? 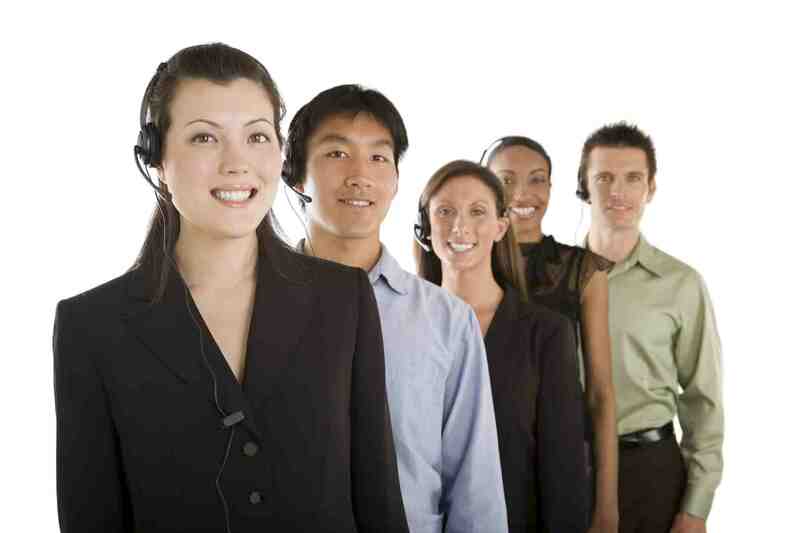 No problem, we’ll provide recommendations and work with your team to integrate it into our system. We just can’t provide ongoing support or guarantee it’ll work as well, or across as many platforms. 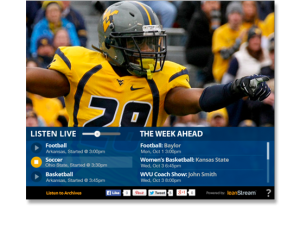 It’s the ultimate audio player for your team, fans and athletics department! GameDay counts down to your next broadcast then automatically switches to play-by-play mode, streams up to 3 events simultaneously and auto-posts every game to your player the minute it’s completed. Radio has great content that listeners want to access at their convenience. Sourcing, editing and posting that content has distracted valuable, and increasingly time-starved, radio personnel from the job at hand, until now. Live2Go completely automates the creation and posting of On Demand content for radio: simply schedule it one-time in our intuitive dashboard and get on with your day! Rock-solid delivery of mission-critical services. We learned early on that there are real advantages to building a dedicated CDN for radio broadcasters, so we’ve built the key pieces of our CDN from the ground up to maximize flexibility and adaptability. And we’re obsessive about dependability, delivering your streams from our network of geographically isolated data centers via a highly robust and scalable network framework built for audio. We know what it’s like to need support, and we treat you as we would like to be treated. With a hands-on support team manned by people who truly care, it’s no wonder that some of our best reviews are about our amazing support. 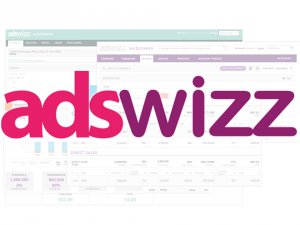 San Mateo, CA, March 15, 2016 — AdsWizz, the leading technology provider of advertising solutions for the digital audio market, announced today the expansion of AdWave, the largest global digital audio marketplace, into Canada. Working with AdsWizz to help facilitate sales to advertisers and their agencies will be Media Sales Lab, one of Canada’s fastest-growing media sales agencies focused on innovative media offerings in broadcast, audio, digital and influencer marketing. Under terms of the deal, Media Sales Lab’s sales team will sell AdWave inventory to Canadian advertisers, capitalizing on the large Canadian digital audio audience. AdWave enables advertisers to deliver targeted audio ads tailored to listeners’ locations, listening devices, demographic categories and other profile elements in the USA, Europe, LATAM, APAC and now Canada. 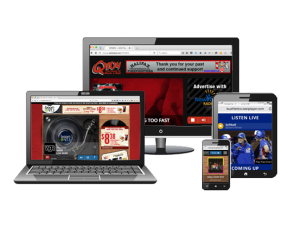 With this partnership, AdsWizz and Media Sales Lab are enabling advertisers to easily reach Canadian audiences across premium radio and music streaming brands. “We are fully committed to the development of digital audio sales in Canada as a new source of revenue for broadcasters and high-value inventory placements for advertisers,” said Chris Nimigon, President of Media Sales Lab. Several of Canada’s leading advertising agencies, including IPG Mediabrands, say they plan to use AdWave. Media Sales Lab is the exclusive sales representative for leanStream, Canada’s leading provider of digital audio streaming services and AdsWizz’s AdWave Canada CDN partner. “Through these new partnerships, AdsWizz is well-positioned to develop the next generation of digital audio advertising solutions to help Canadian publishers and advertisers capitalize on the growing market in Canada,” van de Wyer added. AdsWizz is a leading global technology provider of advertising solutions for the digital radio and audio industries. Its server-side solutions and global audio ad exchange offers advertisers unique targeting capabilities and provide audio publishers powerful new ways to monetize their listenership. This has led AdsWizz to quickly become a go-to resource for many of the world’s most prominent advertising agencies and digital audio publishers. Media Sales Lab is one of Canada’s fastest growing media sales agencies and represents innovative media offerings in broadcast, audio, digital and influencer marketing with broadcasters and advertisers across Canada. leanStream is Canada’s premiere radio streaming solutions company, serving professional broadcasters across the country and in the US, Europe and Asia on a state of the art delivery network with rock solid reliability and powerful monetization, audience-insight and productivity tools. 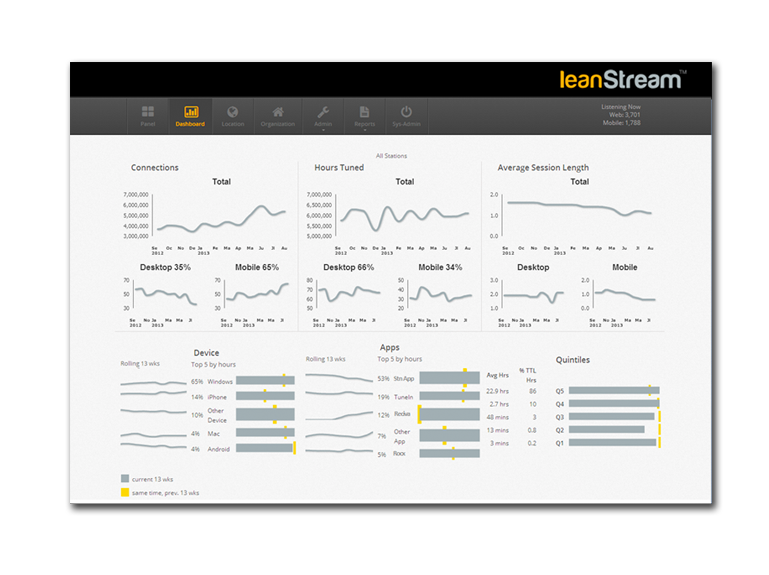 leanStream, a leading streaming solutions provider for radio broadcasters, has strengthened its commitment to the evolution of online audience measurement through the integration of Nielsen’s player SDK into the leanPlayer and GameDay web and mobile players. 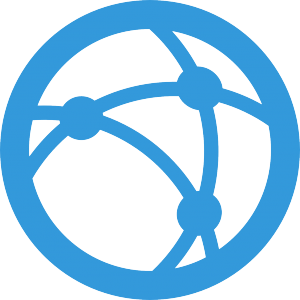 Nielsen’s certification of the software integration confirms leanStream’s hybrid HTML5 players as a verified source of vital end-user listener analytics. The addition of Nielsen’s SDK allows Nielsen subscribers to unify analytics across linear and digital platforms, measuring the extension of broadcast radio to streaming environments. leanPlayer is a cloud-based audio player built to maximize playability, auto-detecting device, browser and OS to seamlessly deliver HTML5 or Flash versions in AAC, MP3 or HLS, making listening online as easy as listening to the radio. GameDay is the audio player of choice for some of the NCAA’s leading Division 1 teams, delivering up to 3 simultaneous live event streams that auto-post at game end, seamlessly switching from Live Broadcast to On Demand mode, counting down to the next scheduled broadcast while hosting full HLS-coded audio archives. 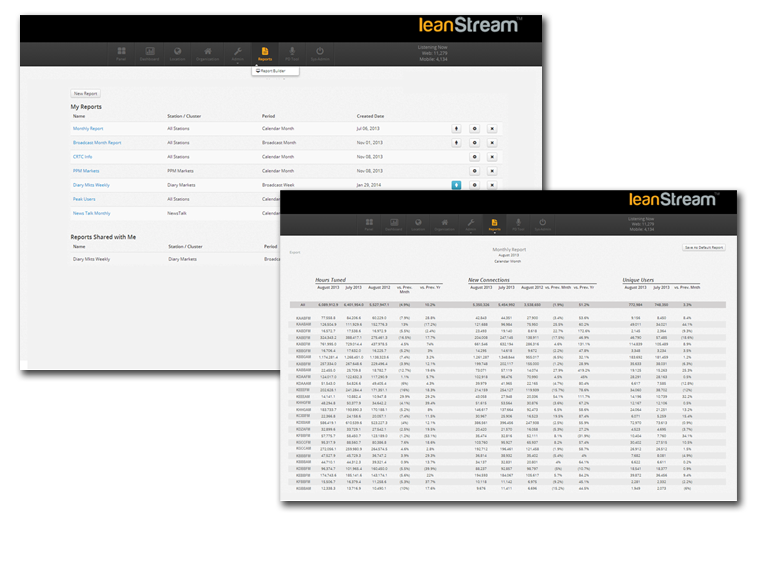 leanStream, Canada’s premiere radio streaming solutions company, today announced that Newcap Radio, Canada’s largest pure-play radio company , has selected leanStream to deliver its audio streaming content. Through this partnership, Newcap will use leanStream’s state-of the-art delivery network and tools to deliver their market-leading radio stations audio content to millions of listeners across the country. “We are thrilled to partner with Newcap and honoured to provide them with the platform and services they need to deliver their award-winning content to audiences across the country” said David Huszar, leanStream President. “Newcap is an audio innovator and a true radio company and we’re excited to work with a team that are as passionate about the audio space as they are”. Through this new partnership, leanStream continues to expand its coverage in Canada, reliably streaming tens of millions of sessions to listeners from St. John’s to Vancouver each month, and is taking a leading role in the development of next-generation digital audio solutions on behalf of Canadian radio broadcasters and listeners. leanStream is Canada’s premiere radio streaming solutions company, serving professional broadcasters across this country and in the US, Europe and Asia on a state-of-the-art delivery network with rock solid reliability and powerful monetization, audience-insight and productivity tools. 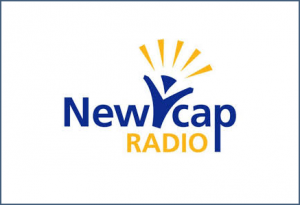 Newcap Radio is one of Canada’s leading radio broadcasters with 95 licenses across Canada. 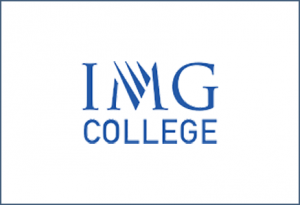 The Company reaches millions of listeners each week through a variety of formats and is a recognized industry leader in radio programming, sales and networking. 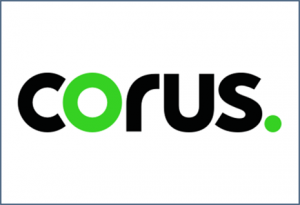 The Company’s portfolio of radio assets includes 80 FM and 15 AM licences which can be heard throughout Canada. 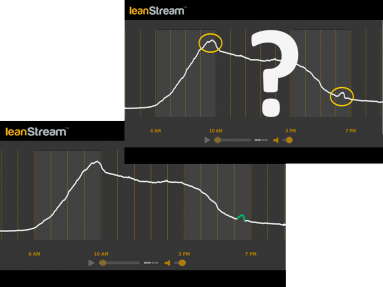 Digital audio companies leanStream and Media Sales Lab announced that they have merged into a single entity. 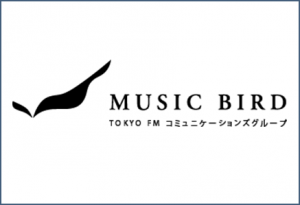 The company will combine the audio ad network of Media Sales Lab with leanStream’s global audio streaming network of more than 400 radio stations. The merger is effective as of June 1 and the new business will retain the name leanStream. The new leanStream will offer a single source for publishers and advertisers to help them connect with online audiences. Media Sales Lab was responsible for producing the inaugural Digital Audio Advertising North Summit in Canada. Now, leanStream will be presenting DAAN. RAIN founder and AccuRadio CEO Kurt Hanson is giving the keynote speech at the free event. DAAN is scheduled for July 11 in Toronto. 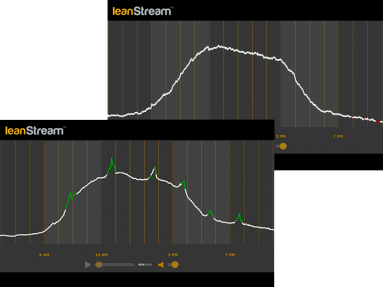 On November 1 2018 the digital audio sales division of leanStream was acquired by DAX, the world’s most sophisticated digital audio advertising platform. leanStream continues in its role serving professional broadcasters around the world on a state-of-the-art content delivery network, enabling audio publishers to take full advantage of the opportunities streaming media offer with rock solid reliability and powerful monetization, audience-insight and productivity tools.